CoinCrack delivers reliable high-quality YouTube views with an amazing support team. A pleasure to work with. Founded in 2013, CoinCrack is a US-based social media marketing company that offers promotional services for Facebook, Twitter, Instagram, YouTube, Vimeo, Google+, SoundCloud, Pinterest, and Tumblr. We tested their services by ordering 1,000 YouTube views. The views all arrived within two days after placing our order. Their retention rate was an above average 60%, and all the views were generated via YouTube advertising. With no live chat or phone support, the only way to speak with them is through their contact form. We think this is not the most convenient way to get in touch with any company – especially for time-sensitive concerns. Nevertheless, CoinCrack is a good YouTube views provider with a solid 7-day money-back guarantee and no-drop refill policy. Click the button below to order one of their highly recommended packages. 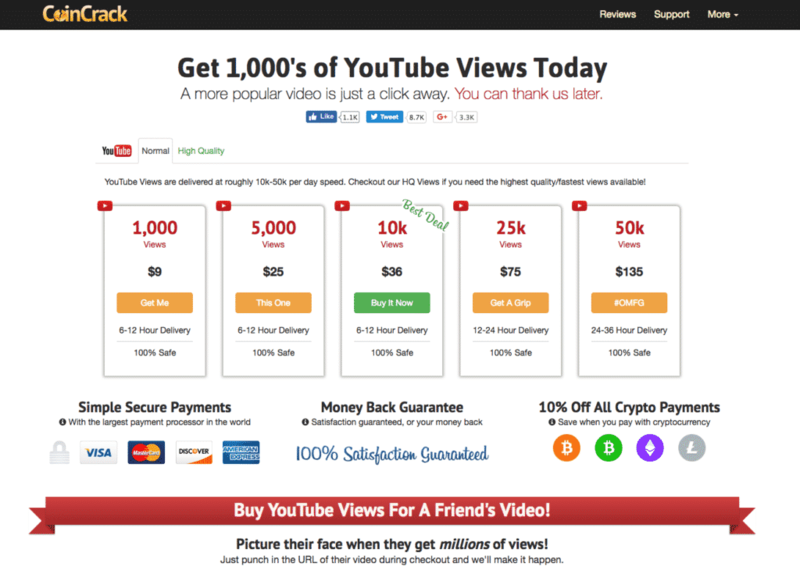 CoinCrack claims to offer high-quality YouTube views using safe methods to deliver your order so they won’t damage your account or reputation. Upon testing their services, we found the results to be realistic and effective, which is in line with their claims. We ordered 1,000 views, which were delivered two days after the order was placed. The audience retention was an above average 60%, and we didn’t lose any of the views, which is always a good sign. According to their website, their delivery time can range from 6 to 36 hours depending on the specifications and size of your order. Our order was completed two days after placing the order, which was longer than expected for 1,000 views. As a bonus, we received an extra 575 views. All of the views were sourced from YouTube advertising, and were from different countries. Their payment methods include PayPal, credit/debit card, and cryptocurrencies. CoinCrack offers subscriber packages to expand your network on the platform. They claim all their subscribers are real people, and that they will start subscribing to your account in 24 hours or less. Their most affordable plan is 100 subscribers for $25. CoinCrack offers services for YouTube comments and likes. Their comments service was unavailable when we tested. Out of all their services, they say their YouTube likes are the fastest to arrive. It can be completed within minutes after placing your order. You can buy 50 YouTube likes for just $9, which is a great price, or go nuts and hype your video with 1,000 likes for $89. Their refund policy extends to their likes and comments packages. CoinCrack doesn’t have the best customer support service. We contacted their customer support via contact form. They told us to check their knowledge base, which pretty much covered everything we needed to know. Their knowledge base consists of every relevant question they have been asked for the past five years. Their expansive knowledge base, and FAQ sections found on each service page, make up for their slower customer support. 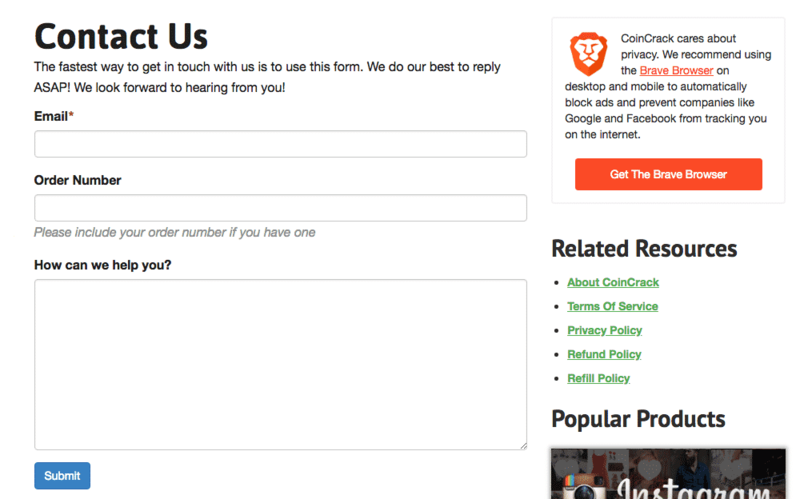 Contact Form – The only type of customer support CoinCrack offers is their contact form, which isn’t easily accessible or visible on their website. You have to click on the “Support” section of their website to go to their knowledge base, then click on the “Here” hyperlink, which will bring you to their “Contact Us” form. This is not the easiest way to contact a customer support team. We received a response six hours after sending our message, and were told to check their knowledge base for the information. CoinCrack offers a 7-day money-back guarantee. The refund policy applies in cases where orders weren’t received due to trouble with their system. You could also request a full refund if you have problems with your account, or you simply weren’t satisfied with CoinCrack’s services within seven days of placing your order. In case any of your views drop, CoinCrack will refill all orders placed in the last 60 days as soon as possible. You can request a refill if you experience a drop below the “Signals” they guarantee. Refills are calculated based on the number of signals that are purchased in the last 60 days. CoinCrack may ask you to disclose personally identifying information, like email addresses or social network profiles. They guarantee that this information will not be sold to a third party, except in the case of CoinCrack merging with another entity. CoinCrack is an above average YouTube views provider. They offer both normal and high-quality YouTube-related packages which can accommodate anyone’s social media budget. They feature a 60% viewer retention rate for their high-quality YouTube views, which is very important to those who are serious about the growth of their YouTube accounts. Additionally, they have solid customer protection policies, which will protect you if some of your views drop, the order is not properly delivered, or if you’re simply not satisfied with the services you received. Their knowledge base is vast and covers the most important questions about buying YouTube views. Their major drawback is in customer support as the contact form isn’t easy to find, and they’re slow to respond. This is minor as they are a quality provider which uses safe methods of delivering their services to make sure that you get what you pay for. Click the button below to visit their website now. Its my third time using coincrack for my youtube views and they have remained consistent in terms of their good service. The views came in fast and in great quality. My video grew tremendously getting both views and likes from all over the world. The views i ordered came within 38 hours after placing my order. What impressed me most was the retention rate which was at an average 80%, this is a big deal for me and am sure for most people in this industry. Coincrack has been my go-to source to boost my weekly videos with views. Never disappointing. Coin crack can probably crack anything. My few thousand subscribers are courtesy of their YouTube subs sale service. The numbers stabilized and not much of a loss.